A plan for a new pedestrian plaza on a street alongside the Georgia World Congress Center begs a question: why are we still treating a large part of Downtown Atlanta as an events-only zone, as if no one lives anywhere around? Does this pedestrianization concept respect surrounding neighborhoods at all? Does it provide benefits equally to them? It certainly doesn’t seem to recognize that people live nearby (and yes, they do). It appears to be all about conventioneers and sports enthusiasts. And not only are there neighborhoods nearby that should be considered with the street design, it’s well worth nothing that people used to live on this exact spot. A whole neighborhood was displaced, prior to the GWCC construction. We’d like to suggest an idea for something to include along with the proposed improvements to the area: Atlanta needs to do better with remembering the many neighborhoods we lost to urban renewal projects. Freeways and events facilities have erased places where Atlantans lived their lives. 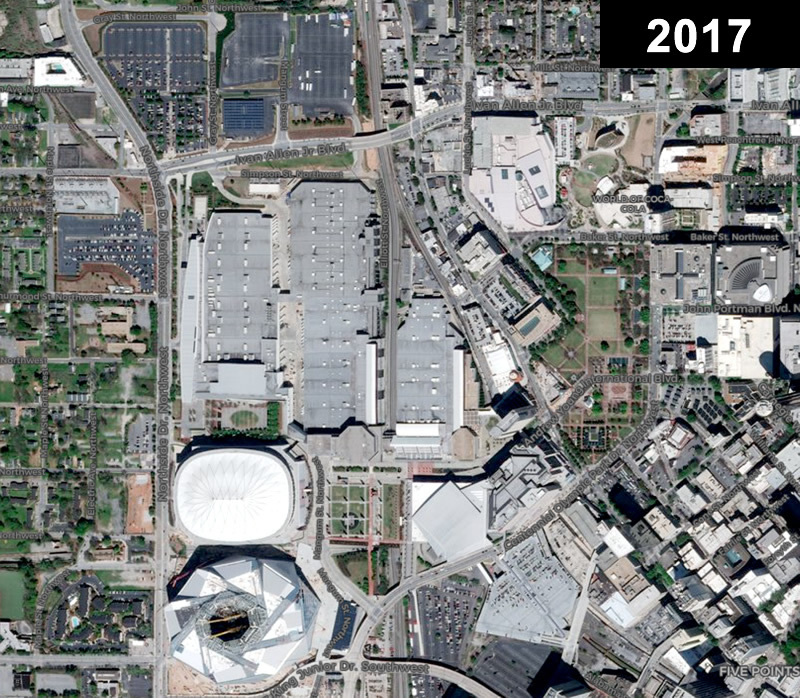 Here’s an image showing a neighborhood called Lightning that used to sit where the Georgia World Congress Center is today. 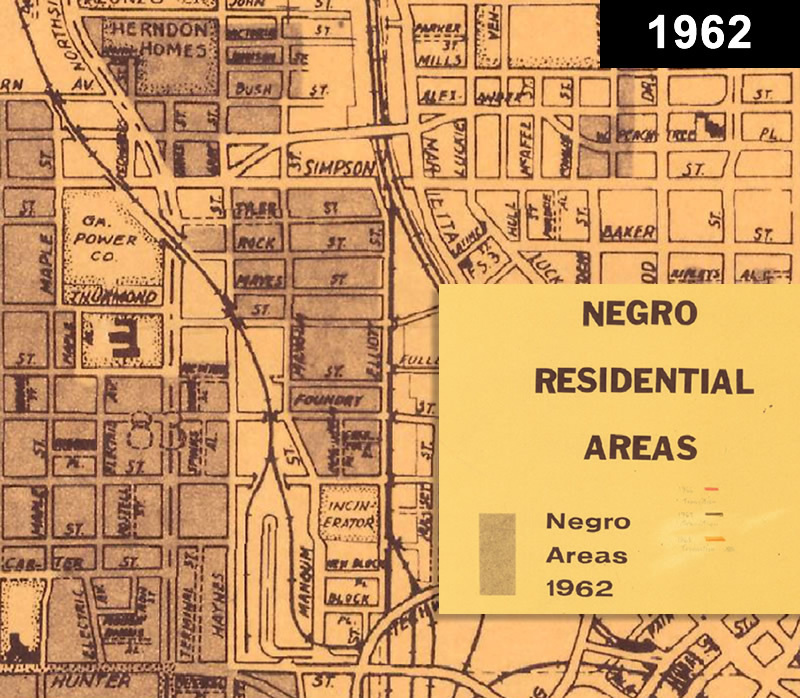 It was an African-American residential area, as this 1962 demographic map shows. Urban renewal projects of the 20th Century affected black Atlantans disproportionately. Let’s commemorate that. How about some info about this in public spaces at the GWCC? The neighborhood of Lightning before it was replaced by the GWCC. Source: ATLmaps.org. 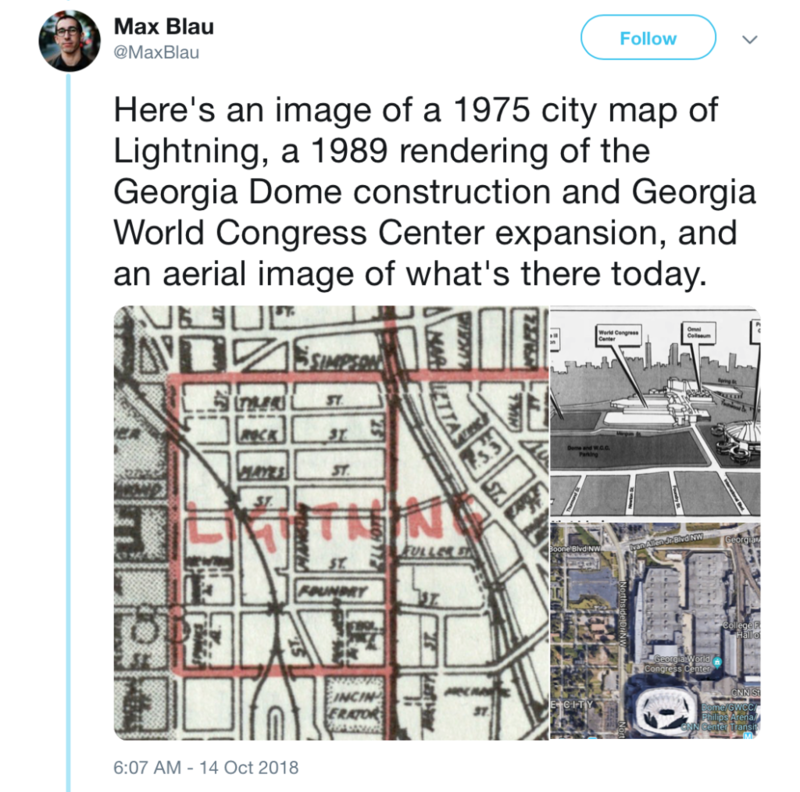 Local journalist Max Blau tweeted about Lightning a few weeks ago, with a 1975 map image of the neighborhood. He’s apparently looking for former residents who can talk about it for a story. 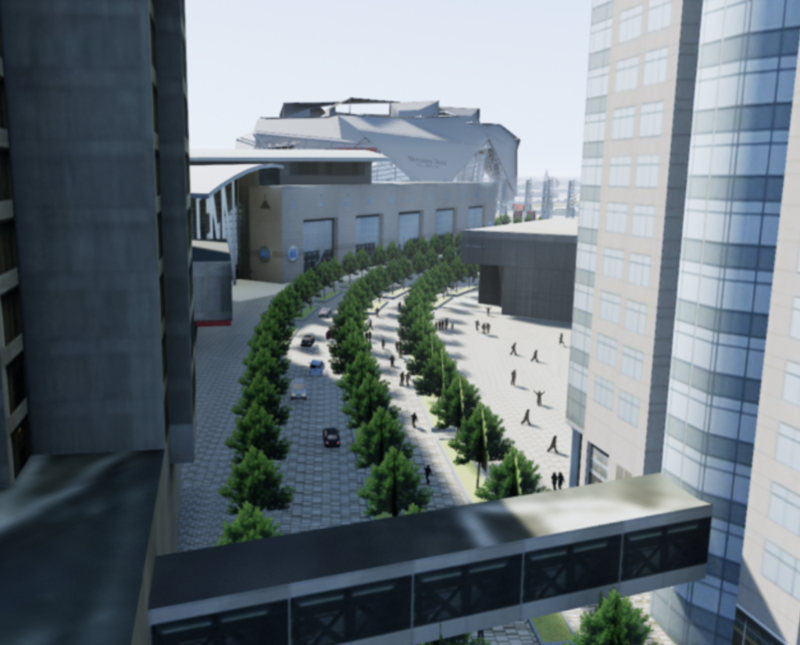 By the way, it’s fairly maddening that the GWCC wants to spend millions to improve the pedestrian experience for people on their campus while, rather than reconnecting Magnolia Street after the demolition of the Georgia Dome (something that advocates pushed for, to improve pedestrian/bike connections), they’re constructing a parking deck on top of it. A reconnected Magnolia Street would be a big boon to foot traffic east and west. And as for Vine City, the neighborhood immediately to the west of the GWCC, all it gets in terms of connection to the east is a ridiculous $27 million City-funded bridge over Northside Drive that no one asked for, and that may or may not even be open all the time, even though local leaders used neighborhood-connectivity as rationale for the funding — when it was obviously a giveaway for the Mercedes-Benz Stadium in anticipation of the Super Bowl. It’s past time for state and local government to recognize neighborhoods both lost and existing with designs at this spot. The days when we blindly designed events facilities for visitors, while ignoring the benefits these spaces in themselves could provide to nearby residents, should be far behind us.